Summer in Hochkönig Lodge | Loads of fun and exciting activities for all. 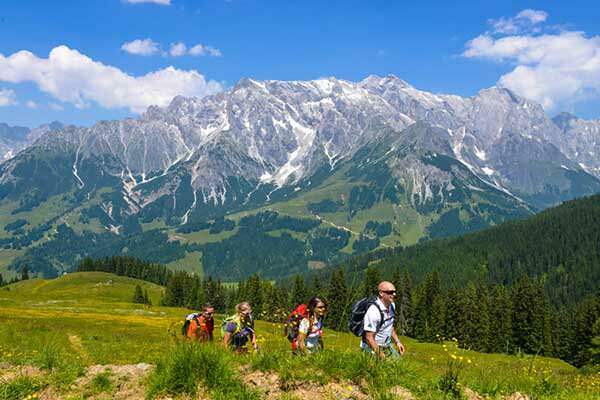 One of the most popular activities in Austria in summer is hiking. The Hochkönig area is great for that with its 340 km clearly marked hiking routes. Also if you would like to hike with kids, there are lots of great routes. You will hike through forests and alpine meadows with beautiful flora and fauna and amazing views. If you are lucky you might see some edelweiss or even an alpine ibex! During the hike you can have a rest at one of the cozy “almhutten” where you enjoy some of the local home made traditional dishes. There are various options for day trips as well as longer trips, like a trip to the Matrashaus at 2941 meter height. Here you can stay for the night and enjoy beautiful sunsets and sunrises over the Alps. Also the Majestätische Weitwanderweg” is a great few days hike of 73 km. With the Hochkönig Card you have the option to use the free “wanderbus” and cable cars to bring you to the mountain station quick. In summer, the Hochkönig area is also great for cycling. You can take a mountainbike or an e-bike to cycle through the most beautiful parts of the alps. There are facilities to charge your e-bike at various locations, which makes cycling in the mountains accessible for the whole family. With the Hochkönig card you can get free guided tours. Also you can take your bike up the mountains in the cable cars, and cycle downhill only, for those who need a rest day. 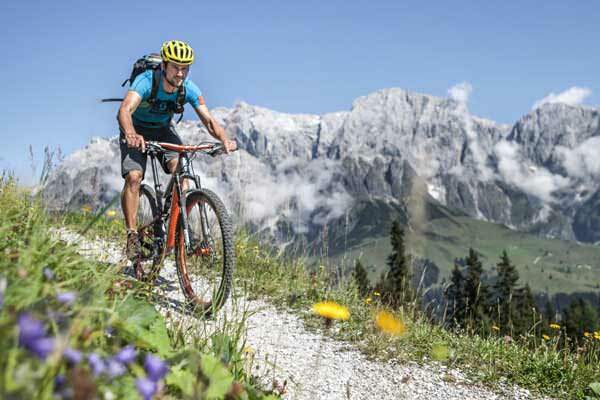 In Mühlbach there are various shops where you can rent mountainbikes as well as e-bikes. The Hochkönig is 2,943 m high. Its size is massive in every respect. It’s not without good reason that the Hochkönig has a legendary reputation among mountain climbers. Among the pros, it ranks up there with the climbing Eldorado of the Arco (Italy) or Chamonix (France). From amateur mountaineers to experienced climbing enthusiasts, there is something to make every climber’s pulse race faster with excitement. 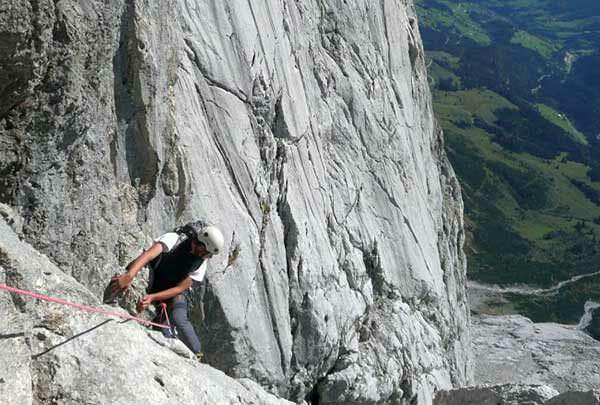 The variety of ascents and routes up to the highest of difficulty levels make the Hochkönig a climbing and sports paradise – the Hochkönig reveals its most beautiful sides when it comes to via ferrata climbs, high alpine routes, and exposed summit tours. Who doesn’t like a swim? And with the wonderful summer climate in Austria, nothing is more refreshing than a nice splash in the pool! In Mühlbach itself, the village of the Hochkönig Lodge is a small swimming pool available. Located in the middle of town it has a heated outdoor pool with large sunbathing area and separate children’s pool with elephant slide. 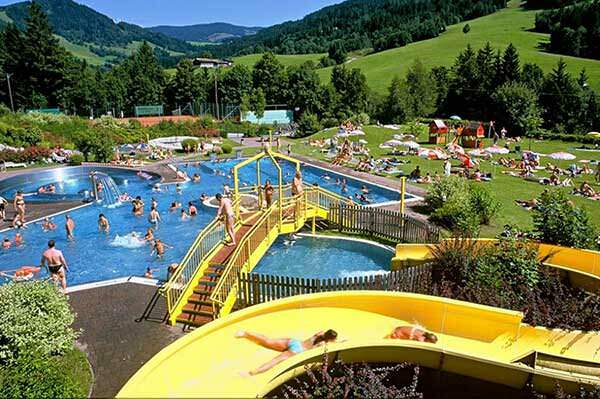 In 25 minutes by car you can get in Maria Alm, where you will find Sommerstein Adventure pool with a 40 m long water slide, lazy river, bubble jets, waterfall shower, bench with massage jets, children’s pool, artificial play stream and playground. Access to these pools is complimentary with Hochkönig card. 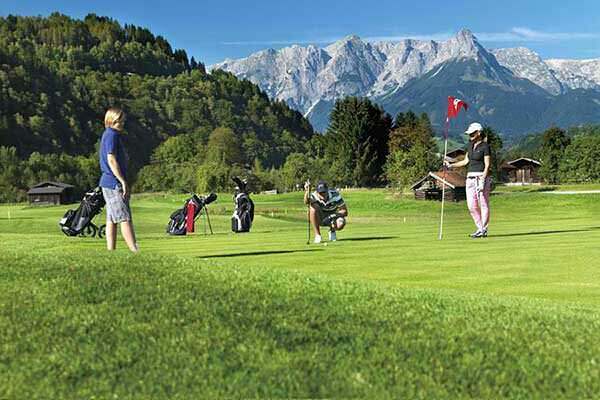 – An 18 holes golf course in Sankt Johann im Pongau. This course also offers all the modern facilities you would be looking for as a golfer nowadays. For more information please visit http://www.golfsanktjohann.at. The longest White Water Rafting Trip in Salzburgerland! 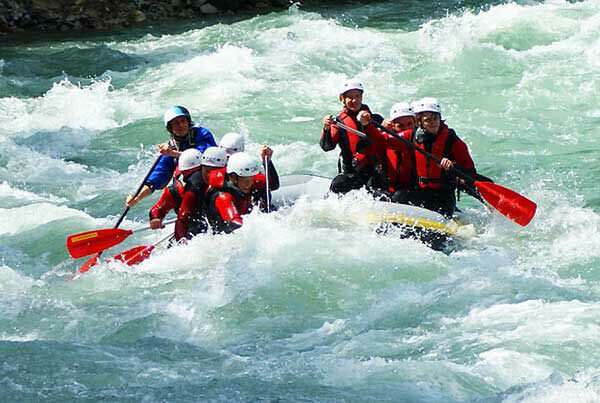 In summer, when high-altitude snow is still melting, experience the thrill of white water rafting on the longest white water trip in Salzburger Land – on the river Salzach, between Taxenbach and Schwarzach. This is around 30 minutes drive from Mühlbach am Hochkönig. After completing an extensive safety briefing in which you are taught all the necessary skills, the adventure begins, lasting approximately 2 hours. A true adrenaline ride for everyone! 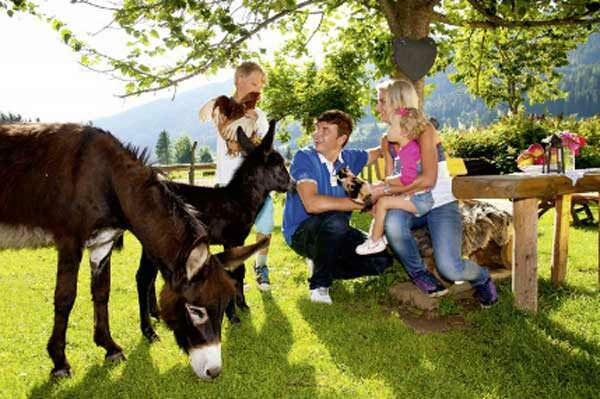 The Hochkönig area is also in summer time very much aimed at delivering fun experiences for kids, especially involving our animals! Enjoy a one-of-a-kind experience while getting to know our animals on a first-name basis! At 6 publicly accessible petting zoos, countless animals are just waiting to be pet by guests of all ages. Including alpacas, pot-bellied pigs, pygmy goats, sheep, ponies, and much more. The petting zoos are open to the public, and admission is free! Fly like a bird in the beautiful summer weather… an experience that will never be forgotten. 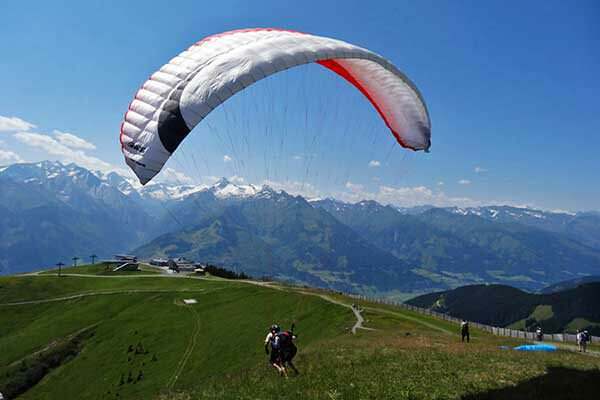 Before you are aware of it, you have left the ground and are smoothly gliding through the air with the beautiful Austrian landscape far below. No previous experience is required to be a paragliding passenger. Anyone from 6 years old and above can paraglide. Depending on weather and wind there are various places around Mühlbach am Hochkönig where you can fly! 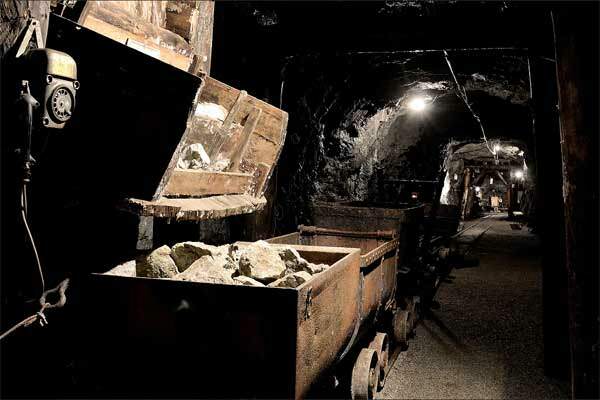 The Mühlbach am Hochkönig area has vast history in mining, that goes 4000 years back in history. This museum, conveniently located in the village provides an unique lookback in the ancient days of mining. The museum has an actual rail track going into the old mines! Inside the museum there is plenty to see and learn about how mining was done throughout the different eras in history. Entrance is free with the Hochkönig card, that is included in your stay in our Lodge. 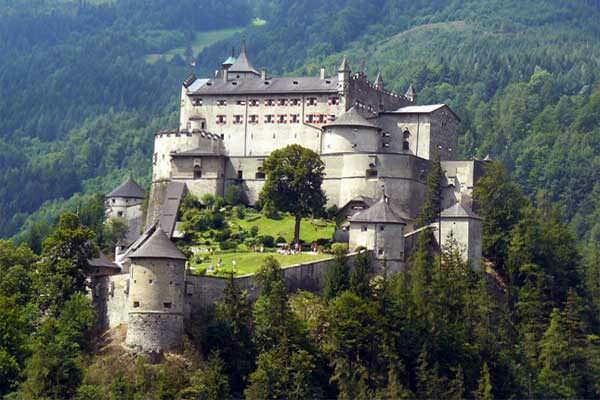 Visitors experience a high-altitude encounter with the past at Hohenwerfen Fortress, a castle dating back over 900 years. This tall, jutting rock, high above the Salzachtal valley floor, offers a gusty view of the surrounding mountains. The feathered hunters of the province’s falconry centre, the dashing weaponry, the museums and the dark corners all encourage visitors to investigate the mighty walls of the castle from within. 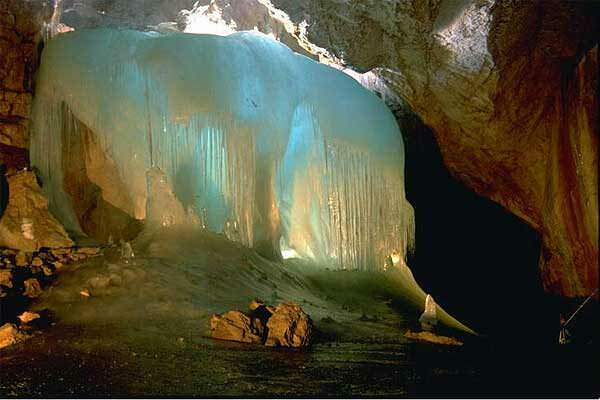 The largest ice cave in the world, this is a true must do experience for everyone! This unique natural wonder can be visited between April and October. There are tours starting every half an hour which take approximately 1.5 hours, however to fully enjoy the caves and the scenery you need at least half a day. Make sure you are well prepared by wearing the right shoes and clothes. Best idea is to arrive early as it can get busy, especially in the summer months July and August. The Liechtenstein Gorge is not only one of the most beautiful, it is also one of the longest and deepest accessible wild water ravines in the Alps. This magnificent natural phenomenon is well worth a visit. 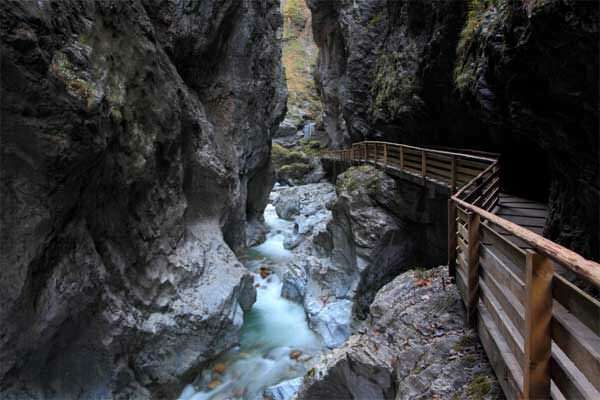 A well-constructed footpath of about 1km in length winds its way through the Liechtenstein Gorge, leading you over sturdy bridges to a magnificent waterfall. Your hike through the Liechtenstein Gorge will take about one and a half hours. The Liechtenstein Gorge is great for family outings. It has sturdy paths and bridges that are safe in any weather. Good boots and warm clothes are recommended depending on the temperature. This route is, arguably, the most beautiful mountain road in the world. The road can be used by cars and motorcyclists but also by cyclists and mountainbikers. The route is 48 km long and connects Bruck and Heiligenblut and you will have an amazing view of the highest mountain in Austria – Großglockner (3.798 m). the road is accessible between May and October. 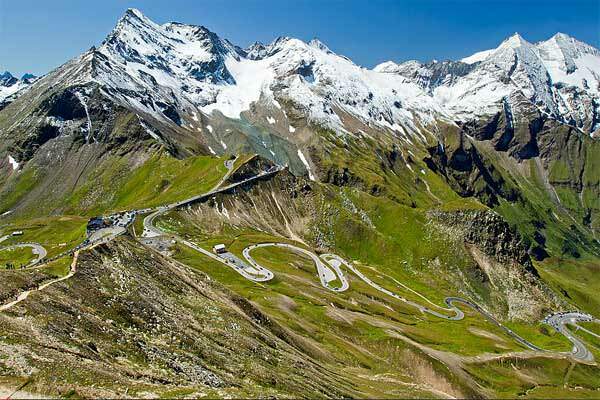 Every kilometer and every single one of the 36 turns of the Grossglockner High Alpine Road is a treat! Kaiser-Franz-Josefs-Höhe is the declared goal of each visitor. It opens up a grand view of Austria’s largest mountain, which even tops the largest glacier in the Eastern Alps, the 9 km long Pasterze, with its 3,798 m.